Wouldn’t it be lovely all the same if we could just step back a little in time? Not too far mind you, just a little would do me. 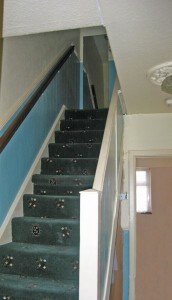 Like the time I sat up near the top of these stairs trying to listen to the conversations of the adults down in the kitchen. They were my Da’s relations you see, who had come all the way out from town to pay us a visit one Sunday. Now the bannisters back then weren’t all covered in as they are in this photograph. No, they were still the original bannisters back then, a little bit like a garden rail type of thing. I wish now I could have gone down into the kitchen with a tape recorder in my hand and recorded all the stories they were telling each other. They must have been great stories because every now and then everyone would break out into an uproar of laughter. One of the relations had this unmerciful shriek of a laugh that made everyone else laugh at that as well, a real high pitch sort of a thing, you know what I mean? The Da’ had brought them up to the Oasis for a few drinks after the tea. Well I remember the noise of the laughing and joking as they came down our road and when the brother came in and told the Ma’ they were on their way down she chased us all up to bed out of the way while she made up some sandwiches from the ham that was left over from the dinner. Great memories. I remember too the time I was sitting there after the Ma’ had sent me to bed early for teasing my younger sisters. And do you know what, that was the worst possible punishment you could give a child back then, especially someone like me who was always tearing up and down the stairs or running in and out of the house on some adventure or other. You see what I did was this, two of the sisters had their hair tied in a pony tail each and I got them to stand back to back and I tied the ponytails together with a bit of string and didn’t I tie it in loads of little knots so that they couldn’t open them too easy. It was just a bit of fun.